Hey guys! I'm so beyond excited for this post y'all don't even know! 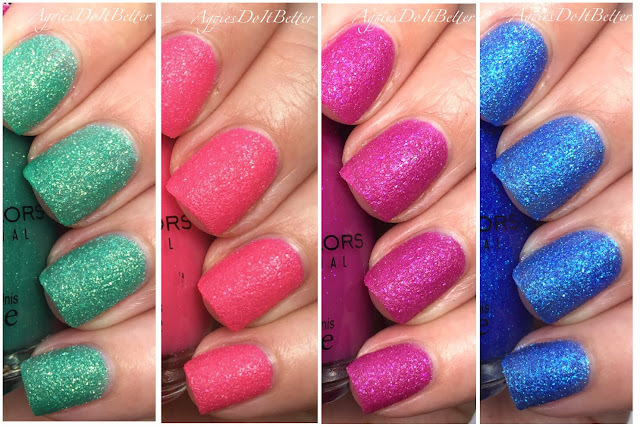 I have had these polishes swatches for over a week and it's been hard to wait to publish them but I had others I wanted to publish first! So far I'm really doing well on my goal of blogging twice a week (it's the most I can fit in right now) but I almost snuck this one in!! 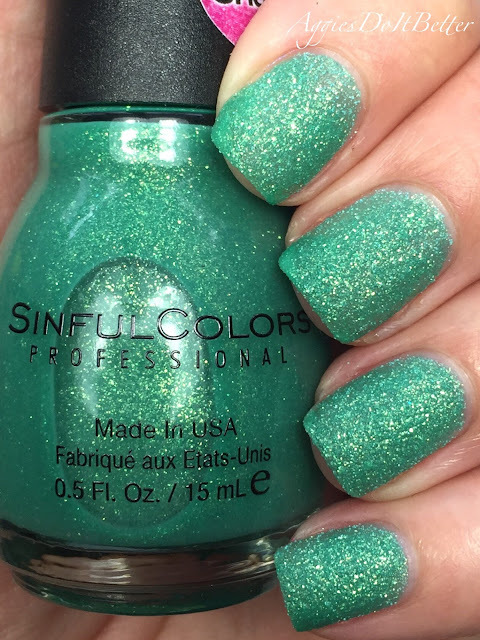 A couple years ago Sinful Colors put out a line of textures, right in the middle of the texture craze (which I'm not over, btw). I never picked them up and I've been kicking myself ever since!! Like seriously my biggest regret that I didn't get!! Especially since everyone who had them said they were great. Then a little over a week ago I found myself at Walgreens for something unrelated and I saw these! They weren't on sale so I paid $1.99 for each, but you better believe I grabbed them FAST! These are also colors I don't have textures of, not that I wouldn't have gotten them anyway ;) I only saw 4 colors, so if anyone knows of more colors be sure to let me know!! Sweet Tooth is a barely-coral pink texture with gold shimmer. I messed with the picture forever and could not get it color accurate-so you'll just have to trust me. It's not as dark as it looks in this picture. It's friggen gorgeous!!! The formula is perfect! This is 2 coats. Sweeten the Teal is an emerald green with STRONG gold shimmer. Man, this one knocked my socks off! And I'm not even a green girl!! This is 2 coats. Surreally Sweet is a darker fuchsia toned texture with purple sparkle. If I had to pick a least favorite it would be this one, but I still love it. 2 coats. If you are wondering how close it is to Zoya Arabella-it's much lighter. And it's also lighter and more berry toned than OPI Samba-dy Loves You. 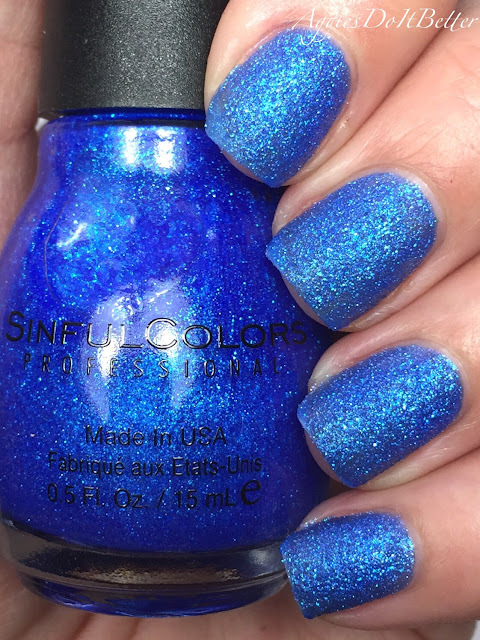 Sugar High is a cobalt blue texture. Oh, happy day! How I have longed for a texture this color. I will say, the formula on this one was a little thinner, this 2 coats but I think on nails any longer than super shorties you would need 3. I'm freaking obsessed with these at the moment!! I wish there was more than 4 colors. I bought these at Walgreens, but I imagine they will be popping up at Walmart and Target as well. The green is a must have!!! Does anyone else have these yet?? Yep...heading to the Walmart asap tomorrow to look for these! lemme know if you find them! can't wait to see them on you :) do you have the og ones?